Every team strives to be the last one standing, but every so often the best club doesn't win it all. For the Class A West Michigan Whitecaps, a disappointing final act could not overshadow a season full of accomplishments. There was no secret formula to the Whitecaps' success. The Tigers affiliate rode a record-setting pitching staff to a remarkable .669 winning percentage, first- and second-half Midwest League division titles and -- despite falling short of its ultimate goal in the playoffs -- the staff and fan selection as Best Team in the 2017 MiLBY awards. "We had a little meeting with the players after the last game of the postseason," recalled West Michigan pitching coach Jorge Cordova. "We told them how important it was that they played hard for us every game of the season. Unfortunately, we didn't get the big hits in the playoffs and that's why we didn't win. But in the Minor Leagues the most important thing is how consistent we can be, and they worked really hard, from April to September, everyday." After starting out with a solid 15-10 record in April, the Whitecaps really hit their stride, rattling off 56 wins over their next 77 games. The team finished with a 91-45 record -- one win shy of the franchise high, set in 1997 -- as well as the best winning percentage of any full-season Minor League team. In a campaign full of highlights, the team's shining achievement came Aug. 11 when Anthony Castro and Trent Szkutnik combined for the team's 24th shutout of the season, breaking a 43-year-old MWL record held by the Quad Cities Angels. It's cliche to say that baseball players and coaches try not to think about setting records and rather take things "day by day." Instead, Cordova challenged his team to embrace the opportunity. "When we got closer to the record, like in July maybe, we started thinking about the records and putting our names in the Midwest League record book. We thought about how good it would feel to accomplish that," Cordova said. "At the beginning of the season I spoke to the staff and told them that it may seem like a lot of people don't care about numbers in the Minor Leagues, but it's no secret that to make it to the Major Leagues, everything is about numbers. So I told them how important it is to perform and be a top pitching staff. So when we got close to the shutout record, we talked about how cool it could be to reach the record and when we reached it, we still improved after that." Indeed they did. The Whitecaps finished the season with 28 shutouts, including three in their last six games. They also broke a team record with 1,260 strikeouts, and the staff boasted a 2.77 ERA, the second-lowest in franchise history. What's more, the Whitecaps paced the Midwest League in nearly every pitching category, including ERA, K's, WHIP (1.12), hits allowed (1,013), walks issued (358) and saves (47). "I'm very proud of the pitching staff. It was an outstanding season," Cordova added. "Everything I asked them for and everything we worked on in the morning or during bullpens -- they applied in the game. That's why pretty much every one of our pitchers was successful this season, and a lot of them earned promotions to the next level. It made me feel very proud of the kids I worked with this year." Eight different pitchers made at least seven starts for the Whitecaps in 2017, and none of them had an ERA over 3.22. The season-long dominance was a group effort, but Austin Sodders, who pitched to a 1.40 ERA in 64 1/3 innings before his promotion to Class A Advanced Lakeland, and Tigers No. 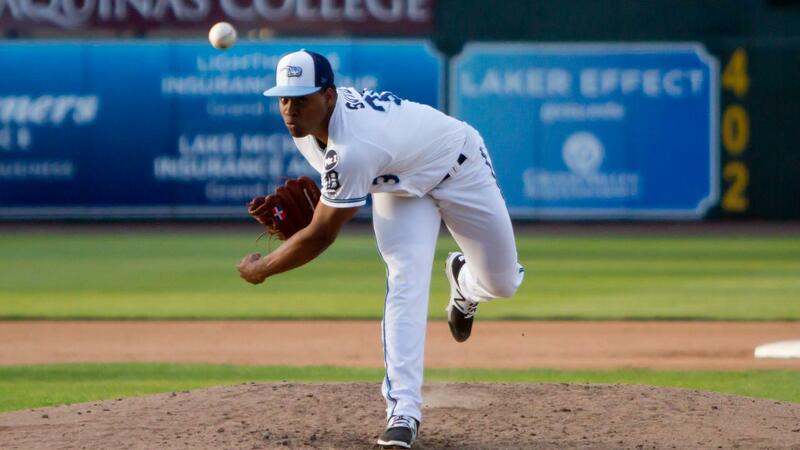 12 prospect Gregory Soto, who went 10-1 and averaged 10.88 strikeouts per nine innings before a callup of his own, were the anchors for Cordova's crew. Soto's performance served as a metaphor for the entire pitching staff. It was clear from the beginning that the 22-year-old southpaw bought into what the organization was asking of him. The results spoke for themselves as Soto finished with a 2.25 ERA and 1.29 WHIP over 96 innings with the 'Caps. "The most important thing with Gregory this year was that we had the opportunity to talk almost everyday about how important it is to be poised, relaxed and to trust your stuff," Cordova said. "Before the season, I could tell he'd get too anxious and excited and want to overpower everybody. That caused him to get out of his rhythm and that's why he was a little bit wild. But this year, he was so poised and he matured a lot. He understood how important it was to pound the zone and pitch to contact, because when you have the kind of stuff he has, you need to be in the zone and let the pitches do the work." While the pitching stole the show, the offense finished third in the MWL in batting average (.264) and hits (1,218) to back up their hurlers. Blaise Salter and Tigers No. 29 prospect Jake Robson each put together stellar first halves and earned promotions to Lakeland midway through the season. Shortstop Danny Pinero served as the table-setter for the West Michigan offense, putting together a .377 on-base percentage in 120 games. "We were so proud of them, as a staff, because they worked so hard," Cordova said. "They knew how important this season was, from the winning percentage to their development to their work ethic, and we were very happy with them."